Braun RT-20 Table Radio. This particular radio is in excellent cosmetic condition with just very few usage marks. The tube radio picks up LW, MW, and UKW signals (Broadcast, Long Wave, and FM). This combination was designed by Dieter Rams and Hans Gugelot (Bauhaus / Ulmer Schule HFG aka “Ulm College of Design”). It’s a classic example of early’New Functionalism’. Graphite enamel on metal face plate, chassis in beech veneer. As already mentioned cosmetic is for its years very nice with some very few signs of wear and age. So the veneers and steel sheet are in a very good condition with very little areas of significant loss (below the grille), but no other forms of major damage. The +50 years are here and there visible, but overall the condition is very good. All graphics are complete. The circular grille is clean and free of dirt or rust etc. See the picture above. As mentioned paint finish is in excellent condition with consistent color. Backside board is even and in a very good condition with valve map fixed on inside surface. Interior is clean, but it has not been cleaned. Weight is approx 8 kg or 17,6 lb. Dimensions are approx: 50 x 25,5 x 18 cm / 19.7 x 10 x 7.1 inch. Built-in voltage converter for 110,125,150,220 and 240 Volt. All switches and knobs work well trebble, bass, etc. The radio has some nice reception even without an external antenna. A truly design classic by Dieter Rams which is in many museum permanent collections, including MOMA. Please see my other auctions for that and other Braun design classics. BRAUN RT20 // DIETER RAMS (1932- present). The clarity of form and minimalist design vocabulary associated with the German designer Dieter Rams is closely identified with the BRAUN Company. Many of his designs for domestic appliances and audio equipment feature in the permanent collections of leading museums that collect and promote design, such as the Metropolitan Museum of Modern Art, in New York, which began to collect Braun products in 1958. After studying architecture at the Wiesbaden Academy of Applied Arts from 1947 to 1953 he spent three years as an apprentice cabinetmaker. This was followed by a period in architectural offices until he joined Braun in 1955. Rams epitomized the clean, austere appearance associated with a functional aesthetic and with associate designer, Hans Gugelot. The Braun range won every international design prize going. At this time he was also involved in furniture development with the designer, physicist, and entrepreneur Otto Zapf (born 1931). As Braun’s design director (from1960), he was responsible for establishing a cleanly stated and distinctive aesthetic for a wide range of products from kitchen appliances to alarm clocks, calculators, lighters, and electric razors. This aesthetic was also in tune with the outlook of the Hochschule für Gestaltung (ULMER SCHOOL), a progressive design academy with links to Braun that had been first established in 1954. His clearly articulated and austere 606-shelf unit for Vitsoe (1960) remained in production for more than 40 years. He has held a number of academic posts including, from 1981, a professorship in industrial design in Hamburg. In 1987 he became president of the German Rat-F-R-Formgebung (Design Council), which for many years had promoted the values associated with ideas of good design. In a recent design magazine (ICON), Rams is quoted as saying, As designers we have a great responsibility. I believe designers should eliminate the unnecessary. That means eliminating everything that is modish because this kind of thing is only short lived. Dieter Rams has received many international design awards throughout his career and his work is considered to be design classics of the highest. In full working order. As shown on pictures. Your satisfaction is guaranteed. Please no personal or postal checks. Super equipment, made by Braun. The item “BRAUN RT 20 DIETER RAMS Design Tube Radio Hans Gugelot Tabletop Vintage Bauhaus” is in sale since Sunday, April 7, 2019. This item is in the category “Antiques\Periods/Styles\Modernist”. The seller is “vende_se” and is located in Werdohl. This item can be shipped worldwide. Braun RT-20 Table Radio. This particular radio is in excellent cosmetic condition with just very few usage marks. The tube radio picks up LW, MW, and UKW signals (Broadcast, Long Wave, and FM). This combination was designed by Dieter Rams and Hans Gugelot (Bauhaus / Ulmer Schule HFG aka “Ulm College of Design”). It’s a classic example of early’New Functionalism’. Graphite enamel on metal face plate, chassis in beech veneer. As already mentioned cosmetic is for its years very nice with some very few signs of wear and age. So the veneers and steel sheet are in a very good condition with very little areas of significant loss (below the grille), but no other forms of major damage. The +50 years are here and there visible, but overall the condition is very good. All graphics are complete. The circular grille is clean and free of dirt or rust etc. See the picture above. As mentioned paint finish is in excellent condition with consistent color. Backside board is even and in a very good condition with valve map fixed on inside surface. Interior is clean, but it has not been cleaned. Weight is approx 8 kg or 17,6 lb. Dimensions are approx: 50 x 25,5 x 18 cm / 19.7 x 10 x 7.1 inch. Built-in voltage converter for 110,125,150,220 and 240 Volt. All switches and knobs work well trebble, bass, etc. The radio has some nice reception even without an external antenna. A truly design classic by Dieter Rams which is in many museum permanent collections, including MOMA. 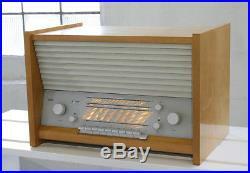 Please see my other auctions for that and other Braun design classics. BRAUN RT20 // DIETER RAMS (1932- present). The clarity of form and minimalist design vocabulary associated with the German designer Dieter Rams is closely identified with the BRAUN Company. Many of his designs for domestic appliances and audio equipment feature in the permanent collections of leading museums that collect and promote design, such as the Metropolitan Museum of Modern Art, in New York, which began to collect Braun products in 1958. After studying architecture at the Wiesbaden Academy of Applied Arts from 1947 to 1953 he spent three years as an apprentice cabinetmaker. This was followed by a period in architectural offices until he joined Braun in 1955. Rams epitomized the clean, austere appearance associated with a functional aesthetic and with associate designer, Hans Gugelot. The Braun range won every international design prize going. At this time he was also involved in furniture development with the designer, physicist, and entrepreneur Otto Zapf (born 1931). As Braun’s design director (from1960), he was responsible for establishing a cleanly stated and distinctive aesthetic for a wide range of products from kitchen appliances to alarm clocks, calculators, lighters, and electric razors. This aesthetic was also in tune with the outlook of the Hochschule für Gestaltung (ULMER SCHOOL), a progressive design academy with links to Braun that had been first established in 1954. His clearly articulated and austere 606-shelf unit for Vitsoe (1960) remained in production for more than 40 years. He has held a number of academic posts including, from 1981, a professorship in industrial design in Hamburg. In 1987 he became president of the German Rat-F-R-Formgebung (Design Council), which for many years had promoted the values associated with ideas of good design. In a recent design magazine (ICON), Rams is quoted as saying, As designers we have a great responsibility. I believe designers should eliminate the unnecessary. That means eliminating everything that is modish because this kind of thing is only short lived. Dieter Rams has received many international design awards throughout his career and his work is considered to be design classics of the highest. In full working order. As shown on pictures. Your satisfaction is guaranteed. Please no personal or postal checks. Super equipment, made by Braun. The item “BRAUN RT 20 DIETER RAMS Design Tube Radio Hans Gugelot Tabletop Vintage Bauhaus” is in sale since Monday, February 4, 2019. This item is in the category “Antiques\Periods/Styles\Modernist”. The seller is “vende_se” and is located in Werdohl. This item can be shipped worldwide. Tube radio + made 1958-59. It was designed by Dieter Rams, Hans Gugelot. BAUHAUS/ ULMER SCHULE ulm school HfG Hochschule fuer Gestaltung. The radio picks up. Broadcast, Long Wave and FM. In full working order. Cosmetic: light signs of wear, for the years in good used condition, cleaned. Has a German cord, comes with an adapter for the USA. Electricity main or alternatively U. 13,3kg / 29 lb. Dimensions: 540 x 355 x 335 mm / 21.3 x 14 x 13.2 inch. (AC) / 110, 125,150, 220 Volt /. I send it away well packed. K 35.00 GBP /. 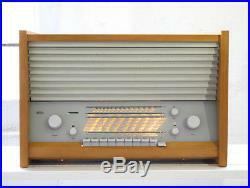 The item “BRAUN G11-7 TISCHSUPER ^ Tube Radio ^ Dieter Rams, Gugelot ^ year 58` Vintage” is in sale since Wednesday, February 21, 2018. This item is in the category “Antiques\Periods & Styles\Mid-Century Modernism”. 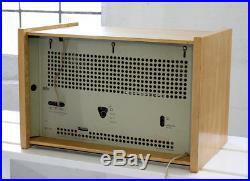 The seller is “julius_n” and is located in Wuppertal. This item can be shipped worldwide. Braun RT-20 Table Radio. This particular radio is in very good cosmetic condition with average usage marks. The tube radio picks up LW, MW, and UKW signals (Broadcast, Long Wave, and FM). This combination was designed by Dieter Rams and Hans Gugelot (Bauhaus / Ulmer Schule HFG aka “Ulm College of Design”). It’s a classic example of early’New Functionalism’. Graphite enamel on metal face plate, chassis in beech veneer. As already mentioned cosmetic is for its years very nice with little signs of wear and age. So the veneers and steel sheet are in a very good condition with no major areas of significant loss, but here and there you will find some usage marks on the front. See the pictures below. The +50 years are here and there visible, but overall the condition is very good. All graphics are complete. The circular grille is clean and free of dirt or rust etc. See the picture above. As mentioned paint finish is in good condition with consistent color, but it’s not brand new. Backside board is even and in a very good condition with valve map fixed on inside surface. Interior is clean, but it has not been cleaned. Weight is approx 8 kg or 17,6 lb. Dimensions are approx: 50 x 25,5 x 18 cm / 19.7 x 10 x 7.1 inch. Built-in voltage converter for 110,125,150,220 and 240 Volt. All switches and knobs work well trebble, bass, etc. The radio has some nice reception even without an external antenna. A truly design classic by Dieter Rams which is in many museum permanent collections, including MOMA. 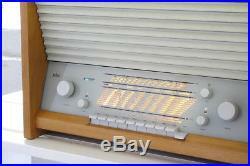 Please see my other auctions for that and other Braun design classics. BRAUN RT20 // DIETER RAMS (1932- present). The clarity of form and minimalist design vocabulary associated with the German designer Dieter Rams is closely identified with the BRAUN Company. Many of his designs for domestic appliances and audio equipment feature in the permanent collections of leading museums that collect and promote design, such as the Metropolitan Museum of Modern Art, in New York, which began to collect Braun products in 1958. After studying architecture at the Wiesbaden Academy of Applied Arts from 1947 to 1953 he spent three years as an apprentice cabinetmaker. This was followed by a period in architectural offices until he joined Braun in 1955. Rams epitomized the clean, austere appearance associated with a functional aesthetic and with associate designer, Hans Gugelot. The Braun range won every international design prize going. At this time he was also involved in furniture development with the designer, physicist, and entrepreneur Otto Zapf (born 1931). As Braun’s design director (from1960), he was responsible for establishing a cleanly stated and distinctive aesthetic for a wide range of products from kitchen appliances to alarm clocks, calculators, lighters, and electric razors. This aesthetic was also in tune with the outlook of the Hochschule für Gestaltung (ULMER SCHOOL), a progressive design academy with links to Braun that had been first established in 1954. His clearly articulated and austere 606-shelf unit for Vitsoe (1960) remained in production for more than 40 years. He has held a number of academic posts including, from 1981, a professorship in industrial design in Hamburg. In 1987 he became president of the German Rat-F-R-Formgebung (Design Council), which for many years had promoted the values associated with ideas of good design. In a recent design magazine (ICON), Rams is quoted as saying, As designers we have a great responsibility. I believe designers should eliminate the unnecessary. That means eliminating everything that is modish because this kind of thing is only short lived. Dieter Rams has received many international design awards throughout his career and his work is considered to be design classics of the highest. In full working order. Little usage marks visible. As shown on pictures. Your satisfaction is guaranteed. Please no personal or postal checks. Super equipment, made by Braun. The item “BRAUN RT 20 DIETER RAMS Design Tube Radio Hans Gugelot Tabletop Vintage Bauhaus” is in sale since Sunday, December 31, 2017. This item is in the category “Antiques\Periods/Styles\Modernist”. The seller is “vende_se” and is located in Werdohl. This item can be shipped worldwide. Braun RT-20 Table Radio. 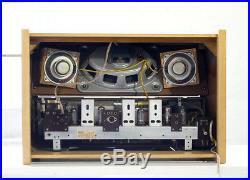 This particular radio is in very good cosmetic condition with just very few usage marks. The tube radio picks up LW, MW, and UKW signals (Broadcast, Long Wave, and FM). This combination was designed by Dieter Rams and Hans Gugelot (Bauhaus / Ulmer Schule HFG aka “Ulm College of Design”). It’s a classic example of early’New Functionalism’. Graphite enamel on metal face plate, chassis in beech veneer. As already mentioned cosmetic is for its years very nice with some very few signs of wear and age. So the veneers and steel sheet are in a very good condition with very little areas of significant loss (below the grille), but no other forms of major damage. The +50 years are here and there visible, but overall the condition is very good. All graphics are complete. The circular grille is clean and free of dirt or rust etc. See the picture above. As mentioned paint finish is in good condition with consistent color, but it’s not brand new. Backside board is even and in a very good condition with valve map fixed on inside surface. Interior is clean, but it has not been cleaned. Weight is approx 8 kg or 17,6 lb. Dimensions are approx: 50 x 25,5 x 18 cm / 19.7 x 10 x 7.1 inch. Built-in voltage converter for 110,125,150,220 and 240 Volt. All switches and knobs work well trebble, bass, etc. The radio has some nice reception even without an external antenna. A truly design classic by Dieter Rams which is in many museum permanent collections, including MOMA. Please see my other auctions for that and other Braun design classics. BRAUN RT20 // DIETER RAMS (1932- present). The clarity of form and minimalist design vocabulary associated with the German designer Dieter Rams is closely identified with the BRAUN Company. Many of his designs for domestic appliances and audio equipment feature in the permanent collections of leading museums that collect and promote design, such as the Metropolitan Museum of Modern Art, in New York, which began to collect Braun products in 1958. After studying architecture at the Wiesbaden Academy of Applied Arts from 1947 to 1953 he spent three years as an apprentice cabinetmaker. This was followed by a period in architectural offices until he joined Braun in 1955. Rams epitomized the clean, austere appearance associated with a functional aesthetic and with associate designer, Hans Gugelot. The Braun range won every international design prize going. At this time he was also involved in furniture development with the designer, physicist, and entrepreneur Otto Zapf (born 1931). As Braun’s design director (from1960), he was responsible for establishing a cleanly stated and distinctive aesthetic for a wide range of products from kitchen appliances to alarm clocks, calculators, lighters, and electric razors. This aesthetic was also in tune with the outlook of the Hochschule für Gestaltung (ULMER SCHOOL), a progressive design academy with links to Braun that had been first established in 1954. His clearly articulated and austere 606-shelf unit for Vitsoe (1960) remained in production for more than 40 years. He has held a number of academic posts including, from 1981, a professorship in industrial design in Hamburg. In 1987 he became president of the German Rat-F-R-Formgebung (Design Council), which for many years had promoted the values associated with ideas of good design. In a recent design magazine (ICON), Rams is quoted as saying, As designers we have a great responsibility. I believe designers should eliminate the unnecessary. That means eliminating everything that is modish because this kind of thing is only short lived. Dieter Rams has received many international design awards throughout his career and his work is considered to be design classics of the highest. In full working order. Little paint loss below the grille. As shown on pictures. Your satisfaction is guaranteed. Please no personal or postal checks. Super equipment, made by Braun. The item “BRAUN RT 20 DIETER RAMS Design Tube Radio Hans Gugelot Tabletop Vintage Bauhaus” is in sale since Monday, September 04, 2017. This item is in the category “Antiques\Periods/Styles\Modernist”. The seller is “vende_se” and is located in Werdohl. This item can be shipped worldwide. Braun RT-20 Table Radio. This particular radio is in very nice cosmetic condition with just very few usage marks. The tube radio picks up LW, MW, and UKW signals (Broadcast, Long Wave, and FM). This combination was designed by Dieter Rams and Hans Gugelot (Bauhaus / Ulmer Schule HFG aka “Ulm College of Design”). It’s a classic example of early’New Functionalism’. Graphite enamel on metal face plate, chassis in beech veneer. As already mentioned cosmetic is for its years very nice with some very few signs of wear and age. So the veneers and steel sheet are in a very good condition with no great areas of significant loss or other forms of major damage. However they are not new and the +50 years are here and there visible. The upper veneer has been restored and some water stains have been removed. All graphics are complete. The circular grille is clean and free of dirt or rust etc. See the picture above. As mentioned paint finish is in good condition with consistent color, but it’s not brand new. Backside board is even and in a very good condition with valve map fixed on inside surface. Interior is clean with no signs of rust or oxidation. Weight is approx 8 kg or 17,6 lb. Dimensions are approx: 50 x 25,5 x 18 cm / 19.7 x 10 x 7.1 inch. Built-in voltage converter for 110,125,150,220 and 240 Volt. All switches and knobs work well trebble, bass, etc. The radio has some nice reception even without an external antenna. A truly design classic by Dieter Rams which is in many museum permanent collections, including MOMA. Please see my other. Auctions for that and other Braun design classics. BRAUN RT20 // DIETER RAMS (1932- present). The clarity of form and minimalist design vocabulary associated with the German designer Dieter Rams is closely identified with the BRAUN Company. Many of his designs for domestic appliances and audio equipment feature in the permanent collections of leading museums that collect and promote design, such as the Metropolitan Museum of Modern Art, in New York, which began to collect Braun products in 1958. After studying architecture at the Wiesbaden Academy of Applied Arts from 1947 to 1953 he spent three years as an apprentice cabinetmaker. This was followed by a period in architectural offices until he joined Braun in 1955. Rams epitomized the clean, austere appearance associated with a functional aesthetic and with associate designer, Hans Gugelot. The Braun range won every international design prize going. At this time he was also involved in furniture development with the designer, physicist, and entrepreneur Otto Zapf (born 1931). As Braun’s design director (from1960), he was responsible for establishing a cleanly stated and distinctive aesthetic for a wide range of products from kitchen appliances to alarm clocks, calculators, lighters, and electric razors. This aesthetic was also in tune with the outlook of the Hochschule für Gestaltung (ULMER SCHOOL), a progressive design academy with links to Braun that had been first established in 1954. His clearly articulated and austere 606-shelf unit for Vitsoe (1960) remained in production for more than 40 years. He has held a number of academic posts including, from 1981, a professorship in industrial design in Hamburg. In 1987 he became president of the German Rat-F-R-Formgebung (Design Council), which for many years had promoted the values associated with ideas of good design. In a recent design magazine (ICON), Rams is quoted as saying, As designers we have a great responsibility. I believe designers should eliminate the unnecessary. That means eliminating everything that is modish because this kind of thing is only short lived. Dieter Rams has received many international design awards throughout his career and his work is considered to be design classics of the highest. In full working order. As shown on pictures. Your satisfaction is guaranteed. Please no personal or postal checks. Super equipment, made by Braun. The item “BRAUN RT 20 DIETER RAMS Design Tube Radio Hans Gugelot Tabletop Vintage Bauhaus” is in sale since Sunday, June 04, 2017. This item is in the category “Antiques\Periods/Styles\Modernist”. The seller is “vende_se” and is located in Werdohl. This item can be shipped worldwide. Braun RT-20 Table Radio. This particular radio is in beautiful original cosmetic condition with very few usage marks. The tube radio picks up LW, MW, and UKW signals (Broadcast, Long Wave, and FM). This combination was designed by Dieter Rams and Hans Gugelot (Bauhaus / Ulmer Schule HFG aka “Ulm College of Design”). It’s a classic example of early’New Functionalism’. Graphite enamel on metal face plate, chassis in beech veneer. So the veneers and steel sheet are in excellent condition with no great areas of significant loss, marks, gouging, staining, or other forms of major damage. All graphics are complete, just the SENDER imprint is little gone, the circular grille is clean and free of dirt or rust etc. As mentioned paint finish is in very good condition with consistent color and with no major blemish damages. Backside board is excellent with valve map fixed on inside surface. Interior is clean, no rust or oxidation. Weight is approx 8 kg or 17,6 lb. Dimensions are approx: 50 x 25,5 x 18 cm / 19.7 x 10 x 7.1 inch. Built-in voltage converter for 110,125,150,220 and 240 Volt. Has a German power cord so an EU/UK/US/ASIA universal plug adapter is included. All switches and knobs work well trebble, bass, etc. The radio has some nice reception even without an external antenna. A truly design classic by Dieter Rams which is in many museum permanent collections, including MOMA. Please see my other. Auctions for that and other Braun design classics. BRAUN RT20 // DIETER RAMS (1932- present). The clarity of form and minimalist design vocabulary associated with the German designer Dieter Rams is closely identified with the BRAUN Company. Many of his designs for domestic appliances and audio equipment feature in the permanent collections of leading museums that collect and promote design, such as the Metropolitan Museum of Modern Art, in New York, which began to collect Braun products in 1958. After studying architecture at the Wiesbaden Academy of Applied Arts from 1947 to 1953 he spent three years as an apprentice cabinetmaker. This was followed by a period in architectural offices until he joined Braun in 1955. Rams epitomized the clean, austere appearance associated with a functional aesthetic and with associate designer, Hans Gugelot. The Braun range won every international design prize going. At this time he was also involved in furniture development with the designer, physicist, and entrepreneur Otto Zapf (born 1931). As Braun’s design director (from1960), he was responsible for establishing a cleanly stated and distinctive aesthetic for a wide range of products from kitchen appliances to alarm clocks, calculators, lighters, and electric razors. This aesthetic was also in tune with the outlook of the Hochschule für Gestaltung (ULMER SCHOOL), a progressive design academy with links to Braun that had been first established in 1954. His clearly articulated and austere 606-shelf unit for Vitsoe (1960) remained in production for more than 40 years. He has held a number of academic posts including, from 1981, a professorship in industrial design in Hamburg. In 1987 he became president of the German Rat-F-R-Formgebung (Design Council), which for many years had promoted the values associated with ideas of good design. In a recent design magazine (ICON), Rams is quoted as saying, As designers we have a great responsibility. I believe designers should eliminate the unnecessary. That means eliminating everything that is modish because this kind of thing is only short lived. Dieter Rams has received many international design awards throughout his career and his work is considered to be design classics of the highest. In full working order. As shown on pictures. Your satisfaction is guaranteed. Please no personal or postal checks. Super equipment, made by Braun. The item “BRAUN RT 20 DIETER RAMS Design Tube Radio Hans Gugelot Tabletop Vintage Bauhaus” is in sale since Thursday, June 01, 2017. 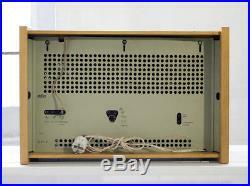 This item is in the category “Collectables\Radio/ Television/ Telephony\Radio\Tube/ Valve”. The seller is “vende_se” and is located in Werdohl. This item can be shipped worldwide. Braun RT-20 Table Radio. This particular radio is in very nice cosmetic condition with just very few usage marks. The tube radio picks up LW, MW, and UKW signals (Broadcast, Long Wave, and FM). This combination was designed by Dieter Rams and Hans Gugelot (Bauhaus / Ulmer Schule HFG aka “Ulm College of Design”). It’s a classic example of early’New Functionalism’. Graphite enamel on metal face plate, chassis in beech veneer. As already mentioned cosmetic is for its years very nice with some very few signs of wear and age. So the veneers and steel sheet are in a very good condition with no great areas of significant loss or other forms of major damage. However they are not new and the +50 years are here and there visible. The upper veneer has been restored and some water stains have been removed. All graphics are complete. The circular grille is clean and free of dirt or rust etc. See the picture above. As mentioned paint finish is in good condition with consistent color, but it’s not brand new. Backside board is even and in a very good condition with valve map fixed on inside surface. Interior is clean with no signs of rust or oxidation. Weight is approx 8 kg or 17,6 lb. Dimensions are approx: 50 x 25,5 x 18 cm / 19.7 x 10 x 7.1 inch. Built-in voltage converter for 110,125,150,220 and 240 Volt. All switches and knobs work well trebble, bass, etc. The radio has some nice reception even without an external antenna. A truly design classic by Dieter Rams which is in many museum permanent collections, including MOMA. Please see my other. Auctions for that and other Braun design classics. BRAUN RT20 // DIETER RAMS (1932- present). The clarity of form and minimalist design vocabulary associated with the German designer Dieter Rams is closely identified with the BRAUN Company. Many of his designs for domestic appliances and audio equipment feature in the permanent collections of leading museums that collect and promote design, such as the Metropolitan Museum of Modern Art, in New York, which began to collect Braun products in 1958. After studying architecture at the Wiesbaden Academy of Applied Arts from 1947 to 1953 he spent three years as an apprentice cabinetmaker. This was followed by a period in architectural offices until he joined Braun in 1955. Rams epitomized the clean, austere appearance associated with a functional aesthetic and with associate designer, Hans Gugelot. The Braun range won every international design prize going. At this time he was also involved in furniture development with the designer, physicist, and entrepreneur Otto Zapf (born 1931). As Braun’s design director (from1960), he was responsible for establishing a cleanly stated and distinctive aesthetic for a wide range of products from kitchen appliances to alarm clocks, calculators, lighters, and electric razors. This aesthetic was also in tune with the outlook of the Hochschule für Gestaltung (ULMER SCHOOL), a progressive design academy with links to Braun that had been first established in 1954. His clearly articulated and austere 606-shelf unit for Vitsoe (1960) remained in production for more than 40 years. He has held a number of academic posts including, from 1981, a professorship in industrial design in Hamburg. In 1987 he became president of the German Rat-F-R-Formgebung (Design Council), which for many years had promoted the values associated with ideas of good design. In a recent design magazine (ICON), Rams is quoted as saying, As designers we have a great responsibility. I believe designers should eliminate the unnecessary. That means eliminating everything that is modish because this kind of thing is only short lived. Dieter Rams has received many international design awards throughout his career and his work is considered to be design classics of the highest. In full working order. As shown on pictures. Your satisfaction is guaranteed. Please no personal or postal checks. Super equipment, made by Braun. The item “BRAUN RT 20 DIETER RAMS Design Tube Radio Hans Gugelot Tabletop Vintage Bauhaus” is in sale since Friday, December 16, 2016. This item is in the category “Antiques\Periods/Styles\Modernist”. The seller is “vende_se” and is located in Werdohl. This item can be shipped worldwide.